David Cay Johnston: More Corporate Tax Breaks Will Not Stimulate the Economy | Democracy Now! Pulitzer Prize-winning investigative journalist. He has the cover story in the latest issue of Mother Jones magazine, titled 'Fiscal Therapy' His most recent book is titled Free Lunch: How the Wealthiest Americans Enrich Themselves at Government Expense (and Stick You with the Bill). He is a former reporter at the New York Times. AMY GOODMAN: President Obama is meeting with Democratic congressional leaders at the White House today to discuss the nearly $900 billion economic stimulus package that the Senate will debate this week. Senior Republicans warned on Sunday they were unlikely to back the bill without changes to what they see as controversial spending provisions. On Wednesday, the House approved an $819 billion version of the plan, but despite an all-out lobbying push by President Obama, not a single Republican voted for it. Obama said he hopes to get the bill through Congress by mid-February. In his weekly presidential radio address, he urged the Senate to pass the bill. PRESIDENT BARACK OBAMA: Americans know that our economic recovery will take years, not months, but they will have little patience if we allow politics to get in the way of action and our economy continues to slide. That’s why I am calling on the Senate to pass this plan, so that we can put people back to work and begin the long, hard work of lifting our economy out of this crisis. No one bill, no matter how comprehensive, can cure what ails our economy. So just as we jumpstart job creation, we must also ensure that markets are stable, credit is flowing, and families can stay in their homes. AMY GOODMAN: The Senate is taking up the bill as news continues to emerge painting a grim picture of the state of the economy. Major US companies announced layoffs in the tens of thousands last week, and new figures show the economy is shrinking at its fastest rate in nearly twenty-seven years. Meanwhile, the number of Americans seeking jobless benefits has hit a record high. David Cay Johnston is a Pulitzer Prize-winning investigative journalist. He has the cover story in the latest issue of Mother Jones magazine, called “Fiscal Therapy.” His most recent book is called Free Lunch: How the Wealthiest Americans Enrich Themselves at Government Expense (and Stick You with the Bill). He joins us now from Rochester, New York. 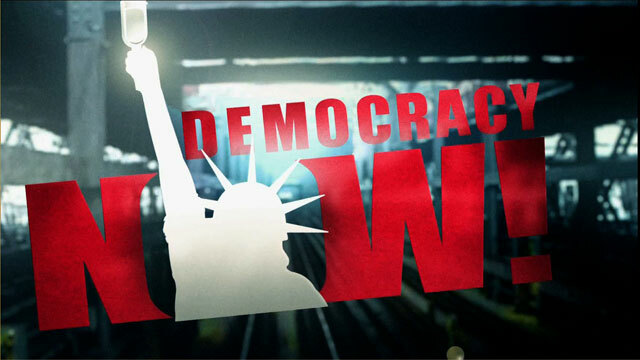 Welcome to Democracy Now!, David Cay Johnston. DAVID CAY JOHNSTON: Well, thank you, Amy. AMY GOODMAN: It’s very good to have you with us. Let us start out with your assessment of this nearly $900 billion economic stimulus plan. DAVID CAY JOHNSTON: Well, probably not big enough, and the Republicans have some credibility on the Christmas tree claim. Even some of the Democrats have not acknowledged this. They need to focus on those things that will increase demand. We’ve had twenty-eight years of supply-side economics. The data is eminently clear: it was an experiment, a radical idea, that did not work, in general. A few successes, but overall it was an utter failure that put us in this mess. And so, the concerns need to be on getting money out there right away; more money for people who are unemployed; extending unemployment benefits longer, if necessary; and then investing money in places where it can be spent quickly that will provide a return. Infrastructure does that, but it takes time. There are lots of scientific research projects that were unfunded, particularly medical projects, for a lack of will by the Bush administration to fund them. We could triple the number of projects that were funded overnight. And there are other areas that could get spending going that will result in people being hired, putting money in their pocket and doing something to build for the future. AMY GOODMAN: Can you talk about — well, in Mother Jones, “Fiscal Therapy” is the title —- “Getting the economy back on its feet, giving taxpayers a break, saving your retirement fund and your kid’s college tuition? Done. And it won’t cost you a penny.” What is it that you are laying that you feel could save the economy? DAVID CAY JOHNSTON: Well, fundamentally, several key pieces. One is, you and I are allowed to save, if we have a 401(k) plan, up to $22,000 a year without paying taxes; if we don’t have one, up to six, if you’re an older American. But executives, movie stars, athletes are allowed to save unlimited amounts of money. Hedge fund managers, unlimited amounts of money, without paying taxes. We should end those deferrals. It will bring in hundreds of billions of dollars. Secondly, the Cayman Islands and other little parasitic operations like it are causing enormous damage to the state of our government’s finances. In 1990, about ten percent of corporate profits were taken in tax havens like the Cayman Islands. Today, it’s roughly one-quarter of all corporate profits. The only purpose served by these operations is to reduce the financial viability of the United States of America government. There’s no reason for us to continue allowing these rules. And the ways that individuals use the Cayman Islands are the same devices that are used by terrorist organizations and narcotics dealers to hide their money, as well as spouses trying to cheat the other spouse in a divorce. One of the things I suggest is that we stop the business of college. We have turned college from an investment in the future of the country into an $85 billion business. It is so unbelievably profitable. Commercial banks, over a long period of time, make a 17 percent annual return on equity, but Sallie Mae makes about 50 percent per year. That’s unconscionable. It’s unnecessary. And we need to get away from that, so that we develop the most valuable resource we have: young minds. AMY GOODMAN: David Cay Johnston, we’re going to break, and when we do, we hope you guys can get a new mic on you. We’re having a little trouble with your sound. David Cay Johnston is author of the piece in the latest Mother Jones magazine called “Fiscal Therapy.” He was a longtime reporter for the New York Times. His latest book is called Free Lunch. Stay with us. I wanted to turn to a comment by Democratic Congress member Barney Frank of Massachusetts, chair of the House Financial Services Committee, one of the authors of the stimulus plan. He was on a panel on ABC’s This Week with Republican Senator Jim DeMint. This is some of what he had to say. REP. BARNEY FRANK: — that cannot be accomplished by a tax cut. No tax cut builds a road. No tax cut puts a cop on the street. No tax cut educates a child in the way that it ought to be done. So this — only tax cuts, at a time when I think we have a deficiency in some areas that are important for the quality of our life, is a big disagreement. SEN. JIM DeMINT: But, George, we — we have programs. I mean, we’re reauthorizing our highway bill this year. REP. BARNEY FRANK: At too low a level. SEN. JIM DeMINT: And, well — well, let’s talk about making it a higher level, but let’s don’t say it’s a stimulus when it’s a government spending plan. And all of these things, the needs in our society, education, these are things we debate every year. SEN. JIM DeMINT: — you wanted to do anyway. REP. BARNEY FRANK: The largest spending bill in history is going to turn out to be the war in Iraq. And one of the things, if we’re going to talk about spending, I don’t — I have a problem when we leave out that extraordinarily expensive, damaging war in Iraq, which has caused much more harm than good, in my judgment. And I don’t understand why, from some of my conservative friends, building a road, building a school, helping somebody get healthcare, that’s wasteful spending, but that war in Iraq, which is going to cost us over a trillion dollars before we’re through — yeah, I wish we hadn’t have done that. We’d have been in a lot better shape fiscally. REP. BARNEY FRANK: That’s the problem. The problem is that we look at spending and say, “Oh, don’t spend on highways. Don’t spend on healthcare. But let’s build Cold War weapons to defeat the Soviet Union when we don’t need them. Let’s have hundreds and hundreds of billions of dollars going to the military without a check.” Unless everything’s on the table, then you’re going to have a disproportionate hit in some places. AMY GOODMAN: David Cay Johnston, what about what Congressman Frank has just said? DAVID CAY JOHNSTON: Well, the congressman was exactly right: spending — tax cuts have not worked. The Bush tax cuts, all of them were financed with borrowed money. And where did we end up at the end of the Bush administration? If you add up all of the bailouts that the Bush administration did in the fall, the investments, the spending and the guarantees, it’s over $8 trillion. How much money is that? It is more than all of the income taxes paid by all Americans for the entire eight years of the Bush administration. The fact is that if you don’t fix and maintain roads, you can’t move goods around efficiently, the economy suffers. If you don’t spend money on higher education, on research and development, the economy suffers. This notion that government money is, as a student once said to me, taken out in the ocean and just dumped has to go away. We need to recognize that government, which is the biggest single part of our economy, is absolutely vital, if we’re going have a robust economy. That doesn’t mean there isn’t waste and stupidity. And corporate America has plenty of waste and stupidity, too. AMY GOODMAN: Well, let’s talk about that. I wanted, though, to start with the tax troubles, since you’re a tax-writing expert, on both Geithner and now the latest news on Daschle. Let’s go with Daschle, who has not yet been approved as secretary of Health and Human Services. Explain what his problem is. DAVID CAY JOHNSTON: Well, beyond his problem with having been paid enormous sums of money by the insurance companies, which are a central feature in our healthcare problems, Mr. Daschle was provided with a car and driver by a hedge fund as part of his work for them. When you receive a perk like that, you have to pay taxes. He owes — I think it’s $143,000 in taxes on this. He wasn’t apparently candid with the Obama people upfront about this. And my guess is he is the norm. If the IRS had the money to check up on everyone who works for these big banks and hedge funds, I think they would find vast amounts of perks that are not being taxed. This is what I — part of my arguing that there are two systems of taxation in the United States, separate and unequal: one for working people and one for the rich and powerful, particularly those who own businesses or control them. Daschle’s problems are very troubling, and — but my guess is that if we had a thorough investigation by the IRS, we would find out he’s the norm among those people. AMY GOODMAN: You know, one of the jokes right now — I heard the refrain over and over on television all weekend — was, of course, the Democrats are for increasing taxes, but never pay them. DAVID CAY JOHNSTON: Well, I don’t know how many Republicans aren’t paying them, because none of them are up for appointment to positions right now — or a couple of them, not very many. And there may be — I have no reason to think that this is a partisan thing. It’s a money thing. AMY GOODMAN: And on that issue of receiving money from the health insurance industry, can you elaborate on that further? DAVID CAY JOHNSTON: Well, Daschle, who is unquestionably, among legislators, a leading figure in understanding and knowing about healthcare, went out and made a lot of money from speeches. I mean, I give speeches for money. I don’t think there’s anything wrong with that per se. But he received so much money, and it came so heavily from the insurance companies. I mean, why do we need to have health insurance? Do we have kindergarten insurance? Do we have police insurance? Do we have road insurance? This is a bizarre system that we have that is unlike that anywhere else in the world, gives us the highest costs in the world and does not make our health status better. AMY GOODMAN: Explain that a little further, because people are so used to health insurance. It’s equated with free market capitalism, yet not the same in other countries. Explain how it operates and how it could be different. You actually have big companies like General Motors now who are really changing the tune in this country around healthcare. DAVID CAY JOHNSTON: Yes. Well, Amy, if you have a business, you have to devote a lot of resources not to running that business, but to negotiating for and dealing with health insurance companies for your workers. Our competitors, the Canadians, the Europeans, the Japanese, the Australians, etc., in all other modern countries, the costs of healthcare are on the books of society, and you don’t insure for that, because this isn’t a risk you’re insuring for; it’s a cost. You know what it will be every year from the size and age of the population. And so, a friend of mine, a former Fox News anchor, thought recently — found a lump in her breast. She’s moving to France. She’s not fully into the French system yet. She went to her neighborhood clinic, because under their system you do have to go to the neighborhood clinic. They saw her in a matter of minutes. They quickly determined that all she had was a cyst. They treated her. And she was out the door after paying a hundred-euro fee. She would have paid no fee whatsoever if she had been fully in their system. And they don’t have doctors devoting hours and hours to cost accounting. We don’t make kindergarten teachers do cost accounting, or police officers or prosecutors. Why do we have doctors doing cost accounting? Because a narrow band of people have become fabulously, unbelievably fabulously wealthy off of this enormously inefficient system we have in America, which doesn’t fit with the principles of capitalism. You know, Adam Smith, who figured out market economics and whose book is still in print 233 years later, said that any policy that benefits the majority of the people must be a good policy. Well, this is not a policy that benefits the majority of the people. AMY GOODMAN: David Cay Johnston, I wanted to go back to the issue of war and what war is costing and when we’re talking about a stimulus plan. DAVID CAY JOHNSTON: Well, let me give you just two — one thing to think about your income taxes. The interest on the debt — the debt that Ronald Reagan promised, if he was elected, he would end — is so great now that it equals all of the money that will be withheld from your paycheck in January, February, March, April and part of May. All of the rest of the income taxes you will pay for the year go to war. They go to the Pentagon budget. Remember, the war in Iraq and the war in Afghanistan are not on the regular budget. They go to the Energy Department, which is the bomb-making division of the military. And they go to Veterans Affairs, paying for past wars. And as Joe Stiglitz pointed out, in terms of personnel costs, the peak year for World War II was 1993. One of the major reasons that we are in so much trouble in this country is that what Reaganism has brought us is spending without taxing, spending that money in ways that are totally unproductive and counterproductive and impose huge costs on the future. And this huge national debt, which is going to get worse with the stimulus, no question, and put us in danger down the road of a big inflation — but what the national debt does, what “borrow and spend” does, is it takes taxes from people who work — because that’s about 85 percent of all income tax money, from people who work — and it transfers it to capital, people who own the national debt. And who owns the national debt? Banks, insurance companies — oh, those are businesses we’re having to bail out — the thugs in China who shoot independent union organizers, and some older wealthy Americans. It’s a redistribution scheme to take money from working people and redistribute it to capital through the tax system. I’m curious, by the way, why the Republicans don’t see this, since they oppose redistribution down. You would think they should be out there actively opposing redistribution up. And a few of them have been. AMY GOODMAN: Looking at the stimulus plan, about $275 billion in tax cuts — that’s the House plan — $545 billion in domestic spending. Explain the tax cuts and the spending and how you think it should be broken down. DAVID CAY JOHNSTON: Well, it’s ridiculous to think that business tax cuts will result in hiring people. I happen to also be the chairman of the board of a little company that I formed with one of my sons. We hire people. We hire people because we have more business. We don’t hire people to get a tax cut. That’s just the most bizarre thing I’ve ever heard. Business decisions are made on the basis of demand. We need to be spending this money to increase demand. That’s not to say that our income tax system isn’t a complete mess. I’ve written two books about that. But this is just not the way to stimulate the economy. My biggest concern is that the stimulus package will not be big enough in the areas that will get people not losing their homes and not accelerating that problem of losing their homes. And if it doesn’t work, imagine what you’re going to be hearing a year from now if the Obama administration has to go back and ask for more money: “Well, this failed, why would we give you any more money?” Better to ask for more than you think you need now and pledge not to spend it if the economy recovers, much smarter to do that. Now, there is one other wrinkle in that, and that is, the Republicans in the House all voted against this bill. It was a free vote for them. They knew the bill would come back to them, so they can be against it before they were for it when the final bill comes back. But if the Republicans seriously continue to fight the idea of a stimulus, and the economy declines, I do wonder if it might not be part of Obama’s strategy to then just have cut the rug out from under them as the economy gets worse, because people are not going to be driven towards Reaganism by an economy that’s declining. And it is declining even worse than the statistic you said. It declined in the last period at a rate of 3.8 percent. But when you add all the inventory, that is, all the goods that were manufactured but not sold, it really declined at a rate of 5.6 percent. And it will get worse, much worse, before it gets better. AMY GOODMAN: David Cay Johnston, do you have any assessment of Judd Gregg, the Republican of New Hampshire that looks like he could be named as the Commerce Secretary, the Republican, the third Republican in the Obama administration, what his record is? DAVID CAY JOHNSTON: I don’t at all, Amy. But I do want to go back to Geithner, because you mentioned him earlier in the show. My column in Tax Notes today is about Mr. Geithner, and it is about how it’s hard to believe his claim that he didn’t know he was cheating on his taxes. I find his testimony implausible, but I do suggest that there is a way to redeem and show that he cares. One of them is to ask all of the tax software companies to report on whether they can find any of the kind of errors that he says existed and correct them, because part of his duty as Treasury Secretary is to make sure the tax system works efficiently. AMY GOODMAN: David Cay Johnston, the issue of these Wall Street firms who have gotten bailout money giving $18 billion in bonuses? DAVID CAY JOHNSTON: Well, first of all, why aren’t we letting companies fail? What is it the government knows that we don’t know, that in a capitalist system they are not allowing failed enterprises to fail, including banks, and then you clean up after them? This does not make a lot of sense. We’ve spent vastly more than we should have needed to already, and yet they’re asking for more. Paying bonuses when a company loses money — maybe there’s an individual trader whose unit made a profit, and he’s entitled to a bonus, but none of the senior executives and the overlay at the top. It’s unbelievable they did this. And Congress can deal with this, by the way. Congress can pass a retroactive tax law. This isn’t like criminal law. After all, Congress passed, and Senator Grassley supported, a retroactive tax increase on students who saved money to pay for their college education. Well, if we can retroactively raise taxes on students who saved money for their college education, by golly, Congress can go after these guys and tax away that money. The tone deafness of this is just utterly beyond belief. AMY GOODMAN: The former mayor, Giuliani, has said that that $18 billion in bonuses will be very important for New York tax revenue. DAVID CAY JOHNSTON: Well, it will be. New York State has created an economy that depends on the lower half of Manhattan for 15 or 20 percent of its revenues. That’s unfortunate. That’s part of this whole device we’ve done, where we have increasingly put the tax burden on those at the top, not as a share of their income, because their incomes have grown so much, but as a share of total government revenues. Our concern ought to be with the integrity of the system. We need to have a tax system that people believe is fair and honest, if we’re going to have our country continue. You know, at Syracuse University’s Law School today, I’ll be teaching my class on how the laws of the ancient world influence the world today and the moral principles underlying the law. And every society that has allowed its tax system to become a cash register for the rich has collapsed pretty quickly after doing that. We need to keep in mind that this is a democratic society. All of us have a government to benefit all of us. And we shouldn’t be forcing you and I to pay taxes to give to the wealthiest people in America in any manner, way, shape or form, but especially not through these bailouts followed by bonuses. Congress has got to act on this and act decisively and not just jawbone, as, fortunately, President Obama did the other day. AMY GOODMAN: And Tax Code 382, talking about loopholes? DAVID CAY JOHNSTON: Transfer pricing. This is the issue by which companies take their profits offshore. A company builds tennis shoes in Vietnam. The finished tennis shoe loaded on a ship costs $1 or $2. While that ship is on its way to the port in Los Angeles, they sell it on paper to themselves at a company in the Cayman Islands, then they resell it to their American distribution company. Well, they price it so that all the profits get taken in the Cayman Islands. The US government does not get much, if any, revenue off the manufacture of that shoe. This is an unbelievably abused system. We know from some court records now, because it’s all done in secret, that some companies got good deals from the IRS and others got bad deals because of this recent, relatively recent, practice of having companies negotiate their taxes. You and I don’t get to go in and negotiate our taxes. There’s a set of rules, and we have to follow them, and the government verifies our income. There’s no reason to allow this system to continue. All it does is undercut the vitality of the government of the United States of America, which is absolutely fundamental to our liberties. AMY GOODMAN: David Cay Johnston, I want to thank you very much for being with us, Pulitzer Prize-winning investigation journalist. He has written a piece called “Fiscal Therapy” in the latest issue of Mother Jones magazine. His latest book is called Free Lunch: How the Wealthiest Americans Enrich Themselves at Government Expense (and Stick You with the Bill).